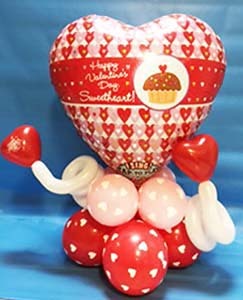 Capture their heart with a balloon bouquet from Balloonatics. Whether it’s Valentine’s Day, a special anniversary, or just to say, “I love you”, a beautiful balloon bouquet is a lasting way to show how much you care. This classic hot air balloon design bouquet can be created in the color of your choice. It comes with either a bottle of Martinelli's™ sparkling cider or a bottle of Korbel Brut Champagne in its passenger basket for an additional $5. Giant mylar balloon letters spell “L,” “V,” and “E” with a giant red heart for the letter “O” accented with heart print balloons for your special someone.. This 7ft arrangement is topped by a 30’’ jumbo balloon covered by hearts and is complimented by clusters of smaller heart-shaped balloons, mylar hearts, and a cute cupid bear. 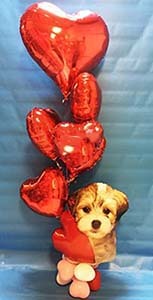 This joyful bouquet consists of a cuddly balloon puppy carrying a bouquet of (6) red mylar hearts. Give your loved one something special with this personalized bouquet using both couple’s initials. This 8 foot tall Very Important Valentine balloon bouquet consists of a myriad of eye-catching valentine theme balloons. It is a guaranteed atttention getter. A giant heart-emblazoned Mylar balloon with red and white mini-heart collars floating 6 feet above the floor on a cascade of red and white ribbon. This Valentine greeting bouquet consists of a 7 foot tal chain of glistening Mylar hearts topped by a giant Mylar "Happy Valentine's Day" greeting. When words aren’t enough, this gorgeous balloon arrangement will sing to your Valentine. A giant heart mylar balloon tops this valentine bouquet. Your loved one’s name is spelled in the letter chain that attaches the heart balloon to its hearts cluster base. This four foot diameter ring is designed as a wall decoration for Valentine theme events. Please call Balloonatics at 408-866-8206 to order. SUBSTITUTIONS: Balloonatics reserves the right to substitute balloons and other bouquet components based on availability. Any component substitutions will be of equal or greater value to assure enjoyment of our bouquet products. DELIVERY: We offer delivery for all balloon bouquets directly to your recipient per your specifications. We deliver throughout the greater San Jose and Santa Clara Valley area, including all of the companies in Silicon Valley and the peninsula cities including Mountain View, Palo Alto, Menlo Park and Redwood City. BIODEGRADABLE: All of the latex balloons used in our bouquets is completely biodegradable. We also do not use plastic clips or other non-degradable materials in assembling bouquets. LONG-LASTING: Mylar balloons will float for several days if not exposed to substantial temperature changes. We also treat our latex balloons with Hi-Float to maximize floating time. ACCESSORIES: Add champagne, sparkling cider or candy (you can find these items on the "Gourmet Accessories" page) to your order for a small additional charge.